Saturday marks 125 years since the opening of the historic building that houses the Art Institute of Chicago. To celebrate that milestone, the museum is inviting the public to recreate a photograph from Dec. 8, 1893 – its opening day. The event takes place at 10 a.m. Saturday on the steps of the museum at 111 S. Michigan Ave., and the new photo will be added to the museum archives. 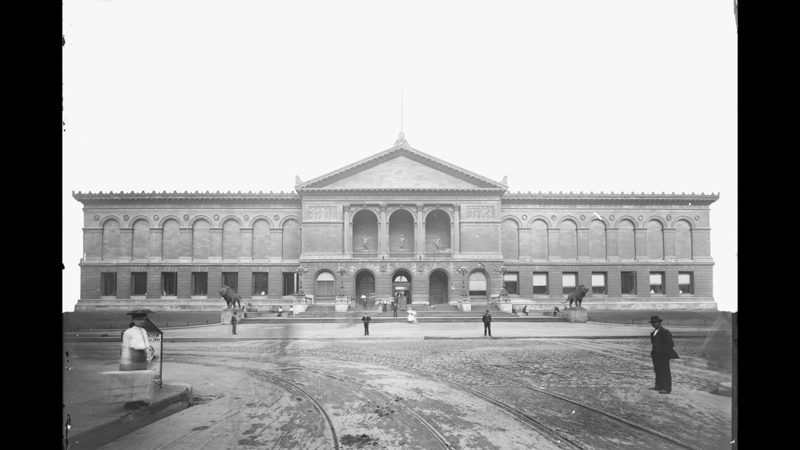 The Art Institute of Chicago opened its new home soon after the World’s Columbian Exposition, which ran from May through October of 1893. Early collectors endowed the museum, and it is now routinely listed as one of the top three museums in the world. In February 2016, James Rondeau became the museum’s 12th director (his full title: President and Eloise W. Martin Director). Rondeau had been with the museum for 18 years as chair and curator of modern and contemporary art. The Art Institute’s most recent renovation was the addition of the Modern Wing, which opened in May 2009. We asked Rondeau whether he thinks future expansions to the museum are possible, given that it’s landlocked by Michigan Avenue and Columbus Drive (to the west and east) and Monroe Street and Jackson Drive (north and south). Also affecting that space is a railway, which Rondeau sees as a point-of-interest. “We’re bisected by an active rail line. I share the view of many of my predecessors that the trains are one of our greatest assets, after our collection and after our staff. There’s hardly a museum in the world where you can look at great works of art and then watch this intersection on our campus all day long,” Rondeau said. Exhibitions opening at the Art Institute in 2019 include “Textiles of the Andes,” new photography by Chicagoan and MacArthur “genius” grant recipient Dawoud Bey, and “Chicago by the Book: Pivotal Works that Changed Chicago” in the Ryerson and Burnham Libraries. The museum’s big summer show will be “Manet and Modern Beauty,” opening May 26. Also on Saturday, in honor of the museum’s anniversary, our sister station 98.7 WFMT will broadcast art-inspired music from 6-11 a.m. During the 10 a.m. hour, they will recreate the concert program performed by the Chicago Symphony Orchestra 125 years ago.